February 25, 2011-NEW YORK, NY- With the success of the 1st and 2nd annual “Walk With Style” charity events held in honor of lung cancer recipients and survivors, The Tesla Group announces their return with the 3rd annual benefit on March 31, 2011 at the Hudson Terrace. This year the beneficiary organization CancerCare will also participate as a Co-host, along with Fashion designers Ali Ro and Hyden Yoo. The Tesla Group has set 2011 as a benchmark year for raising funds to support CancerCare. Last year’s hosts Hilary Rhoda (supermodel) and Kerry Rhodes (Arizona Cardinals) helped raise awareness about the leading cause of cancer deaths in both men and women. This year we want to focus on achieving our fundraising goals to sustain CancerCare’s free professional support services to anyone affected by cancer. Now with the full support of CancerCare, the gala has expanded its fashion and entertainment segments to ensure “the city that never sleeps, will once again embark on a night to remember while raising funds in support of people facing lung cancer. 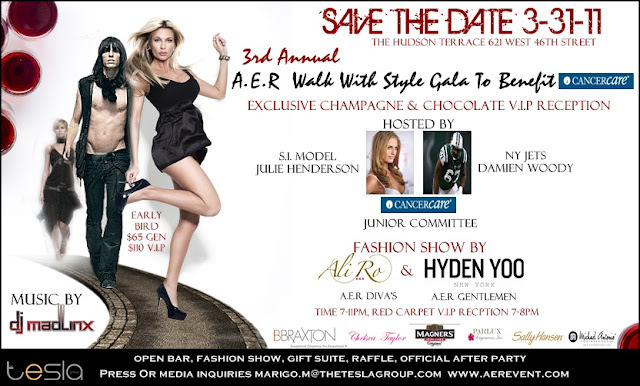 There will be a luxurious Champagne & Chocolates V.I.P reception hosted by CancerCare’s Junior Committee, Sports Illustrated model Julie Henderson and New York Jets pro bowler Damien Woody with V.I.P. attendees escorted onto the red carpet. Back by popular demand is MIXT dance, providing the opening performance for our explosive runway show. Designer Ali Ro’s. “Ali Ro’s Collection” of contemporary dresses weaves together the energy of young Hollywood style icons with the ease and smart fashion sense of the classic woman. The collection has been seen on a number of celebrities including Kim Kardashian, Rihanna, Denise Richards, Sophia Bush, Anna Lyn McCord, and Vanessa Williams. Celebrity makeup artist Victoria Stiles enhances the runway models again for the 3rd consecutive year, along with Emmy Award winner and founder of “Paint and Powder Cosmetics”, Suzanne Patterson who will also lend her support and presence this year to the event. With the consistent support from professional athletes increasing the number of males attending the event, The Tesla Group will also introduce Hyden Yoo’s menswear collection, adding a stylish spring touch to the itinerary. Hyden Yoo’s design philosophy continues to help men transition from day-into-night by utilizing subtle details to create modern silhouettes from classic tailored sportswear pieces. Hyden Yoo’s collection has been featured in Details, GQ, Nylon Guys, Antenna, Complex and more. Guests of the 3rd Annual “Walk With Style” event will enjoy the sleek and sophisticated rooftop ambiance of the Hudson Terrace. Complimentary passed hors’ d oeuvres provided by Artistic Events along with a full open bar. The official A.E.R celebrity DJ Mad Linx returns as the ultimate party rocker to keep guests moving throughout the night. In addition A.E.R replaces its vendor booths, with stylish cabanas in which sponsors can provide product sampling and mini services. CancerCare will also host a cabana with a number of raffle items from companies such as Juicy Couture, NBA, HBO, Tom Ford, The Daily Show, Marie Robinson Salon, and Korres to name a few. Add in an official after party, V.I.P gift bags, and guests will once again be delightfully thrilled. With over 20-30 celebrities who support the event each year, The Tesla Group is in the process of securing two additional host to the event and will make an official announcement within the coming weeks. The Tesla Group remains committed to providing awareness and fundraising support to CancerCareand will once again be donating event proceeds to the national non-profit organization which has been in existence since 1944. To learn more visit http://www.cancercare.org/ or call 1-800-813-HOPE (4673). The Tesla Group is a boutique PR, Branding & Events company specializing in music, fashion, sports, and lifestyle brands within the entertainment industry. Its mission is to provide unique and innovative means for brand awareness, fully promoting products and services for both individuals and businesses while playing a part in community affairs. CancerCare is a national nonprofit, 501(c)(3) organization that provides free, professional support services to anyone affected by cancer: people with cancer, caregivers, children, loved ones, and the bereaved. CancerCare programs—including counseling and support groups, education, financial assistance and practical help—are provided by professional oncology social workers and are completely free of charge. Founded in 1944, CancerCare provided individual help to more than 100,000 people last year, in addition to the more than 1 million unique visitors to our websites. Minx Everywhere at Paris Fashion Week! Paris Fashion Week has come and go! Fashion week isn’t just about clothes. Everything from accessories, hair styles, make-up, and even nails can really make a statement during these shows. Minx of course was found all around Paris and at some of these amazing fashion shows! Gorgeous Ice Queen/Crystal Cave theme for the Alexander McQueen Autumn/Winter 2011 Show. Minx co-founders Janice Jordan and Dawn Lynch-Goodwin and U.K. nail stylist Marian Newman came up with the black fading to silver with white crystals as to go with the theme of an Ice Queen looking out of a cave. In the silver faded area, you can see the white crystals the imitate the ice you would see in a wintery cave. Janice and Dawn, along with a team, applied the Icy nail fashion to 35 models for the Alexander McQueen fashion show. Photos courtesy of Becky Maynes. These fabulous gold nails weren’t just an accent to Vivienne Westwood’s Gold Collection which debuted March 4th in Paris. U.K. nail stylist Sophy Robson came up with the idea of using gold Minx with a brushed metal top. Once again the Minx co-founders were called on to bring find the perfect mirrored-look nail fashion to go with the collection. Minx, Sophy decided, would be the best way to create the mirrored effect instead of nail polish. Love the Minx used in the Alexander McQueen and Vivienne Westwood fashion shows! Don’t you? I like this, but I’d love it in a bright colour! Introducing the first capsule collection by Ela Kowalewska. The idea behind the collection is “humble luxury where refined and sophisticated silhouettes strive to showcase, rather than upstage the wearer.” The collection consists of a predominantly neutral palette that is complemented by bright hues of smaller items of the collections. Click here to see more colours! So what do you think? Like it? Love it? Not so much? Thanks to Charise from Kaeru Communications for sharing this with us! Today marks the 100th anniversary of International Women’s Day. So ladies, stand up and be proud! Today to commemorate the anniversary of International Women’s Day the Assaulted Women’s Helpline launched their campaign called “Who Would You Call?” . This campaign is to simply celebrate and pay tribute to the important friends and family in your life that we can call no matter what time of day it is. There are about 49,000+ women living in Ontario that aren’t so fortunate and have the helpline to listen 24/7. With this, the Assaulted Women’s Helpline is inviting people to write a story (or letter, or blog post, or poem or film a video or whatever else you can think of) to honor your amazing friend (s). Today is the launch of the website and the campaign will continue until April 15th. The Assaulted Women’s Helpline is a toll free crisis line service for all women in Ontario. We provide crisis counselling, emotional support, information and referrals 24 hours a day and seven days a week. The main goal is to get people talking and thinking – by celebrating your uber-fantastic friends and recognizing that we’re pretty lucky to have friends like that to celebrate – not everyone is in the same boat and that’s why the Helpline exists.